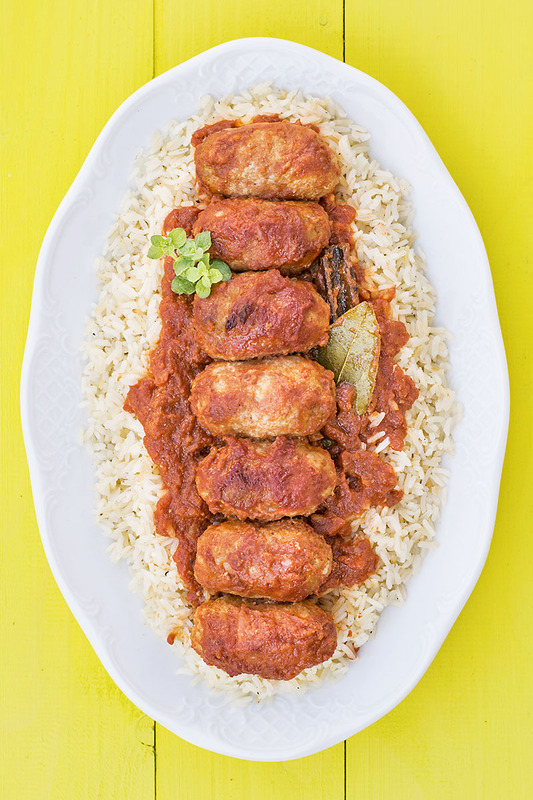 This recipe for Greek baked meatballs in tomato sauce (a.k.a. soutzoukakia) is the perfect family dinner. And it’s always served with rice! Greek people hold a special place in their hearts for minced/ground meat and have developed a lot of recipes as an expression of this love. So, they have filled pies with it – like this Mediterranean minced meat pie with phyllo – they’ve made meatloaves filled with hard-boiled eggs and they’ve topped platefuls of spaghetti with fragrant, meaty Bolognese sauces. But according to the Mediterranean diet, meat dishes are usually eaten once a week (or even once every other week) so, how is this plethora of recipes justified? My belief is that just because meat is not an everyday thing, when you have it on the menu (usually on Sundays or holidays and other celebrations) you must make the most of it. 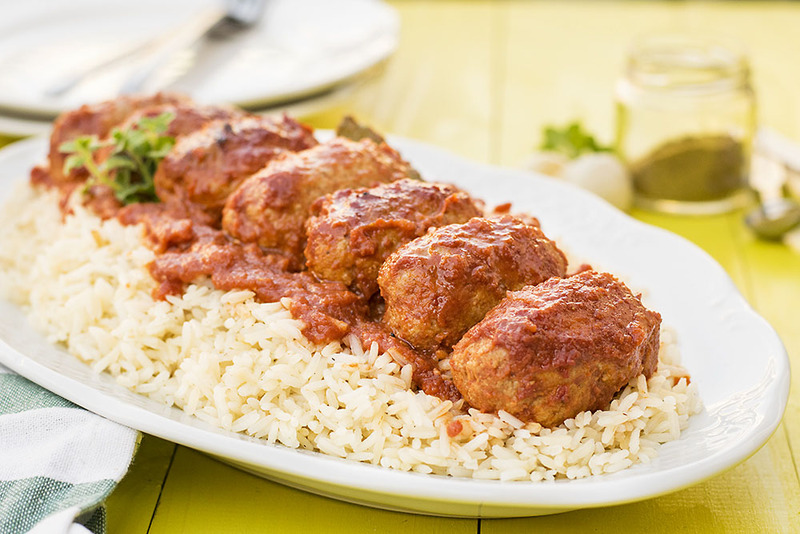 Cumin and garlic are the characteristic ingredients that separate soutzoukakia from all the other kind of meatballs. Some recipes call for 2 teaspoons of ground cumin per pound of meat, while others settle with just half a teaspoon. I prefer to use half a teaspoon for the meatballs and a quarter for the sauce, but you can increase the amount of cumin to your liking. Also, the original recipe for soutzoukakia asks you to fry the meatballs first and then finish cooking them in the tomato sauce. Since this method is more time consuming and produces a “heavier” dish, I prefer to just bake them in the tomato sauce. Another thing I like to do is to use lean ground beef and add some olive oil to the mixture. This way I reduce the percentage of saturated fat while adding some healthy monounsaturated fatty acids. Substitute oats (or gluten-free bread crumbs) for regular bread crumbs if you don’t eat gluten. 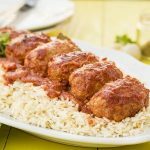 This recipe uses lean ground beef and olive oil as a healthier option but you can also use a mix of ground pork, lamb, and beef and reduce the olive oil to 1 tablespoon. Substitute allspice for cinnamon for a different flavor profile. Mix all the ingredients for the meatballs in a large bowl and knead the mixture with your hands until smooth and homogenous. Let it rest in the fridge. Heat a saucepan over medium/high heat, add the olive oil, the onion, the garlic clove, the cinnamon stick, the bay leaf, and the cumin and stir until the onion is translucent and soft, about 3-5 minutes. Add the wine and when it is evaporated add the tomatoes, salt, pepper, and sugar. Reduce heat to low and let it simmer for 5 minutes. Lightly oil a rectangular pan or casserole approximately 8x11 inches (20x28 cm). Take the meat mixture off the fridge, lightly wet your hands and pinch off a piece of the meat mixture, the size of a walnut. 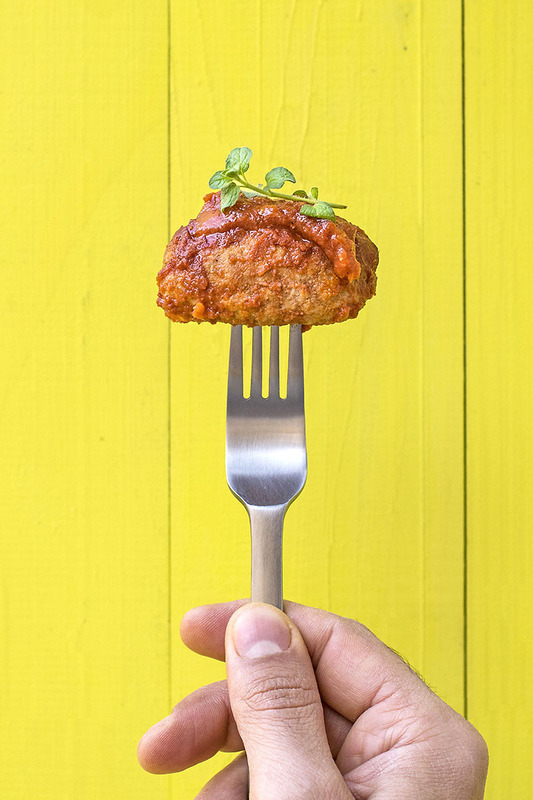 Gently roll it between your hands to form a meatball, then, roll it again to elongate it and form a “soutzoukaki”. Place the soutzoukaki into the pan and continue with the rest of the mixture (wet your hands before each meatball to prevent the mixture sticking to your hands). 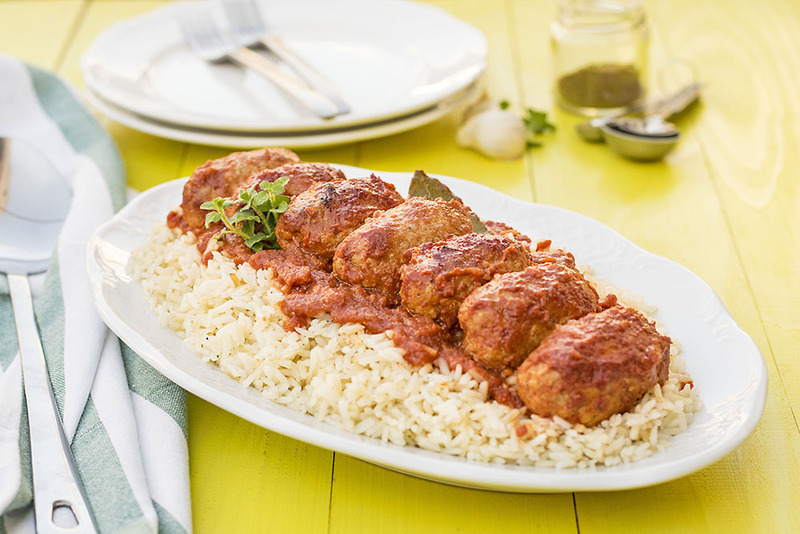 Pour the tomato sauce over the meatballs and bake for 40-45 minutes. Love love your video my friend!! Bravo sou.